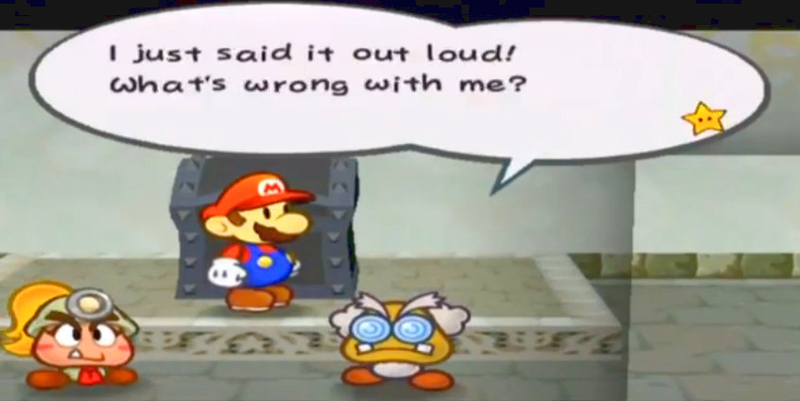 *Note: images below come from YouTube and Super Mario Wiki. *Please Read Thousand-Year Curse Part 1 before continuing! 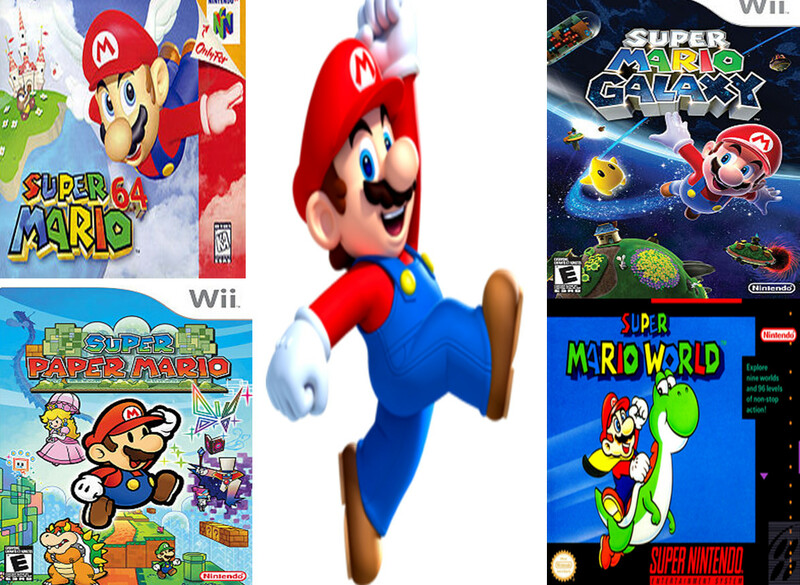 Due to Mario’s spotless and spectacular history, several generations of fans have bought millions of games featuring the titular character’s bouncy romps through the Mushroom Kingdom. 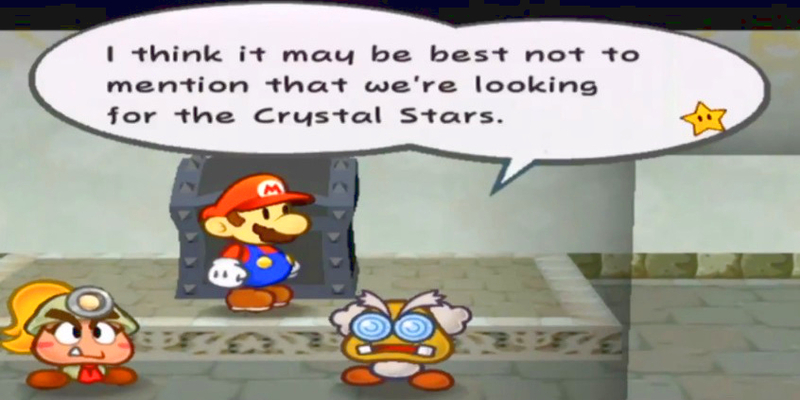 This has made the Mario series the best selling game franchise of all time. However, as we began to see in the first installment of this article and Mario-Another Jesus, there is much more to the classic series than most people realize. 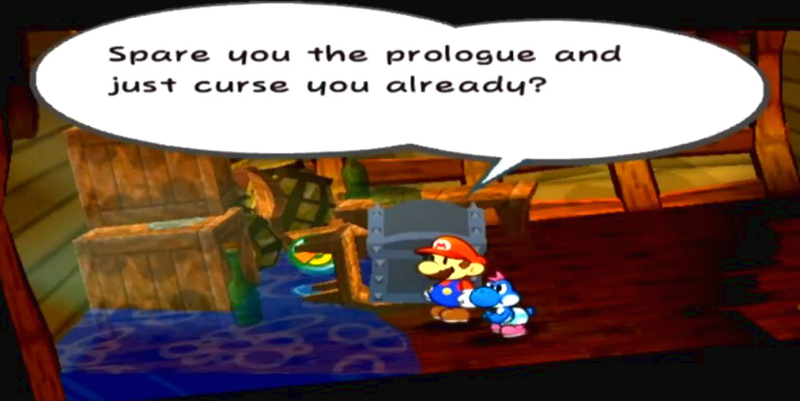 In Part 1, we looked into the history and biblical identities of Rogueport, the Shadow Queen, and the Four Heroes. At the end of the article, we saw how the Four Heroes are cursed and subsequently transformed into the Black Chest Demons. 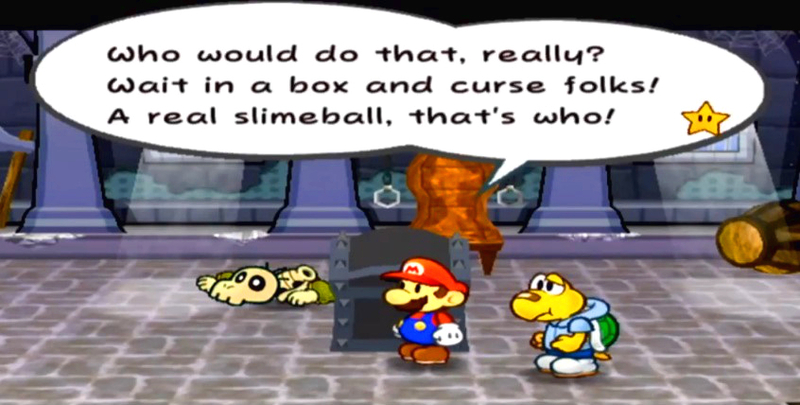 In this article, we’ll continue the story by following the thread of curses in Paper Mario: The Thousand-Year Door. 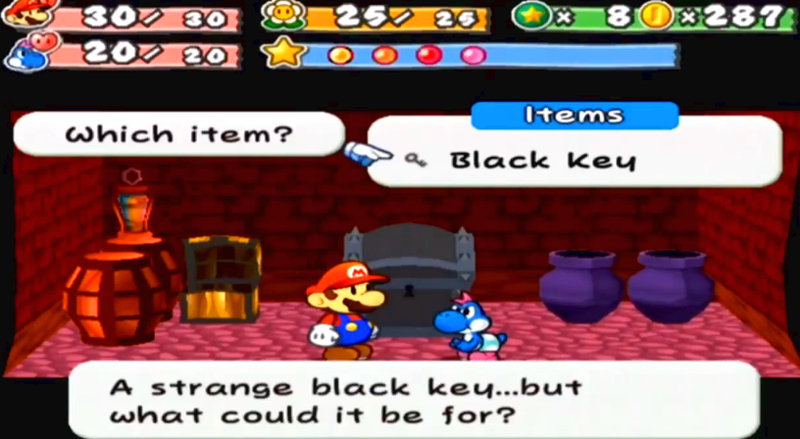 The Four Heroes have been transformed into the Black Chest Demons, and for those whose experience with the franchise doesn’t extend far past Super Mario Bros. on the NES, their role is quite alarming. 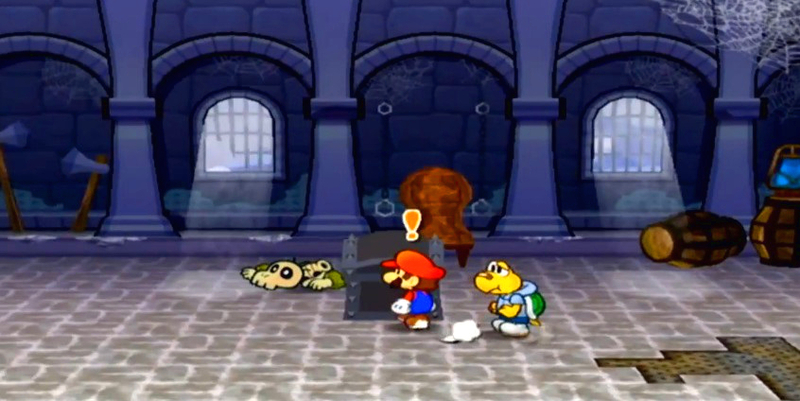 At certain points in the game, players will come to an obstacle that cannot be passed simply by running and jumping. Beyond this outcropping spans a wide chasm. …The demon inside then curses the player (and by extension Mario), blessing him with special abilities. The Biblical implications of this act, both in and out of game, are staggering. Due to the basic format followed by each encounter with the Black Chest Demons, we’ll discuss them collectively rather than following them in sequence (which would take around 300 images according to my count). However, we will identify the demon speaking by it’s number (Demon #1, Demon #2, etc…). After finding a chest, you then begin communicating with the devil inside. Mario gives a hop of disbelief. As you can see, the devil promises rewards in return for the player serving it. [Jesus’ temptation in the desert] “Again, the devil taketh him [Jesus] up into an exceeding high mountain, and sheweth him all the kingdoms of the world, and the glory of them; And saith unto him, All these things will I give thee, if thou wilt fall down and worship me. “Even all nations shall say, Wherefore hath the Lord done thus unto this land? what meaneth the heat of this great anger? By the time Mario meets the fourth and final chest, he’s so tired being lied to he TELLS IT to curse him. 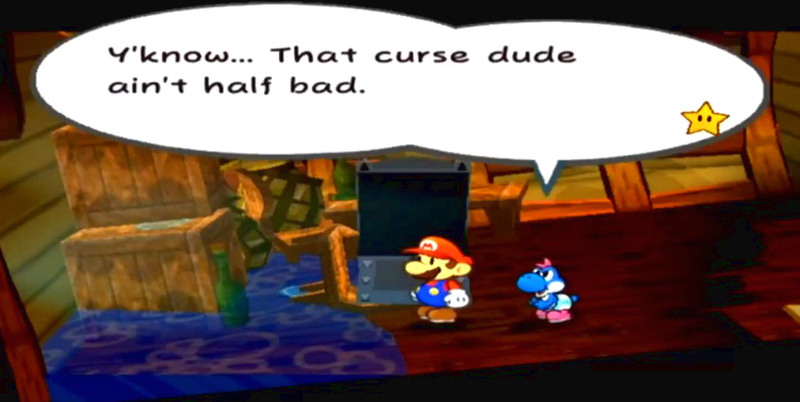 Mario tells the chest to curse him. “The governor answered and said unto them, Whether of the twain will ye that I release unto you? They said, Barabbas. Pilate saith unto them, What shall I do then with Jesus which is called Christ? They all say unto him, Let him be crucified. And the governor said, Why, what evil hath he done? But they cried out the more, saying, Let him be crucified. When Pilate saw that he could prevail nothing, but that rather a tumult was made, he took water, and washed his hands before the multitude, saying, I am innocent of the blood of this just person: see ye to it. …crumpling up and evaporating into thin air. 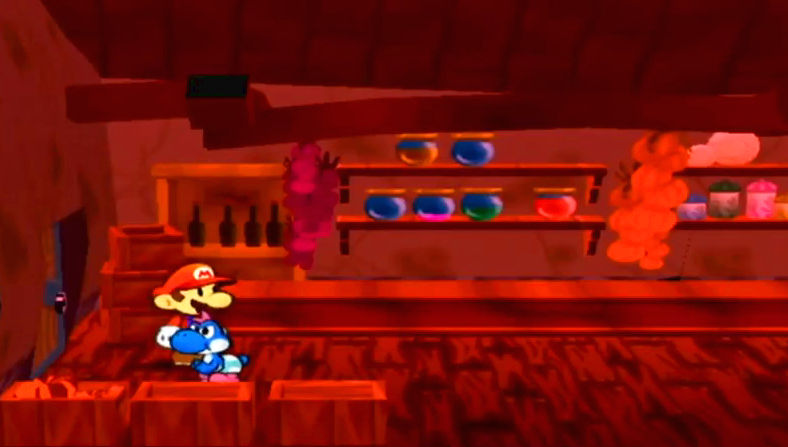 The chest opens and Mario is pulled into the demon’s world. 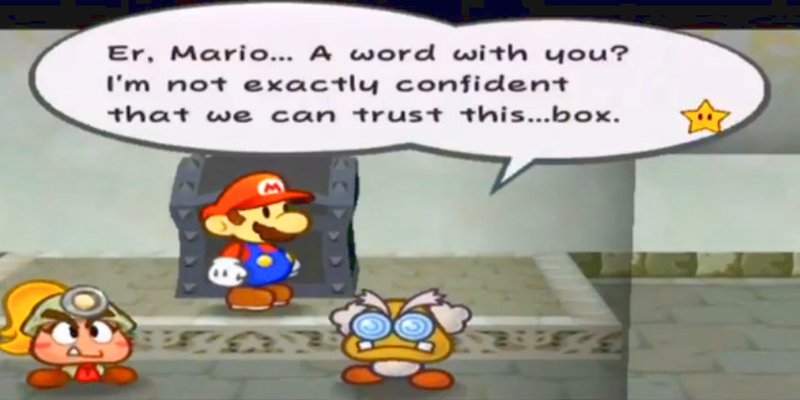 The chest opens, revealing a crumpled-up wad of paper. …eventually filling the entire screen. Emerging from the darkness is the demon. “The earth mourneth and fadeth away, the world languisheth and fadeth away, the haughty people of the earth do languish. The earth also is defiled under the inhabitants thereof; because they have transgressed the laws, changed the ordinance, broken the everlasting covenant. 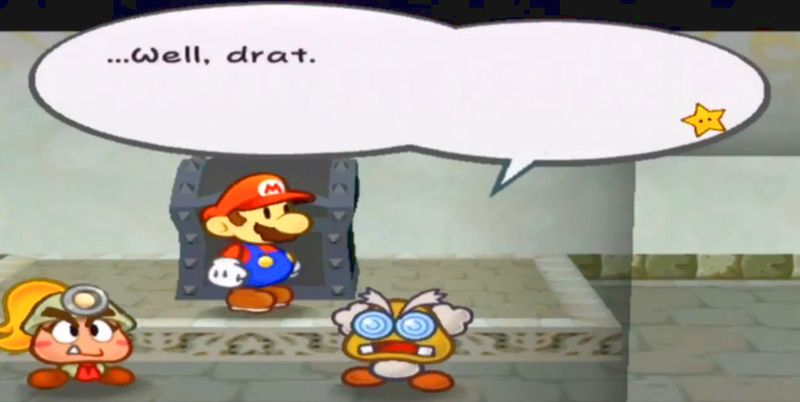 Mario as a piece of paper. 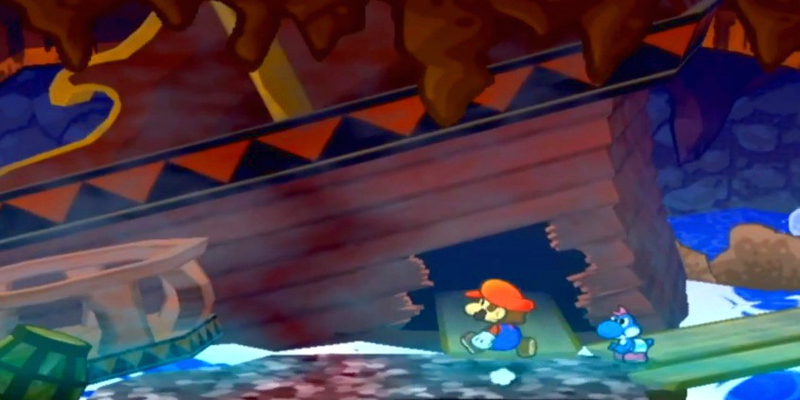 Mario as a paper boat. I’d like to draw your attention to something for a moment. You see, there are two messages being communicated in the Black Demon Chest sequences we’ve been covering in Paper Mario: The Thousand-Year Door. We’ll call them Lower Level and Higher Level (the obvious and the non-obvious). Basically, this is a template of devil worship, occurring without any of the MANY consequences both listed and unlisted in this article. I think we could agree this message is VERY dangerous. However, just as dangerous (and surprising) is the Higher Level, less obvious message being broadcasted to the player at the exact same time. The emphasis on Mario’s suffering [“SUFFER! SUFFER! SUFFER!“]. 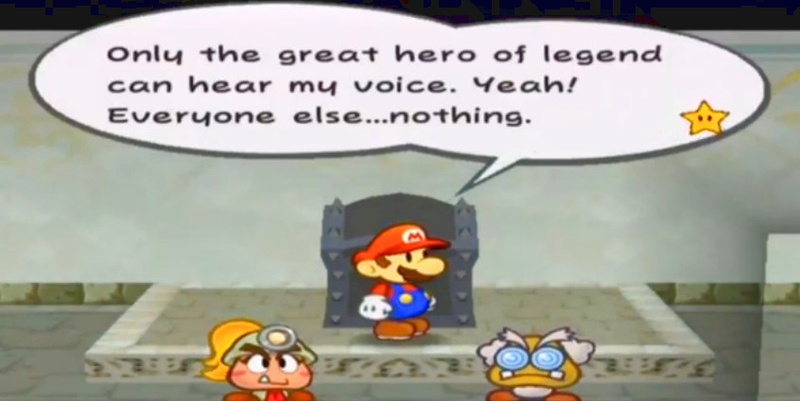 The fact that Mario is presented as an object of worship other times in the franchise. 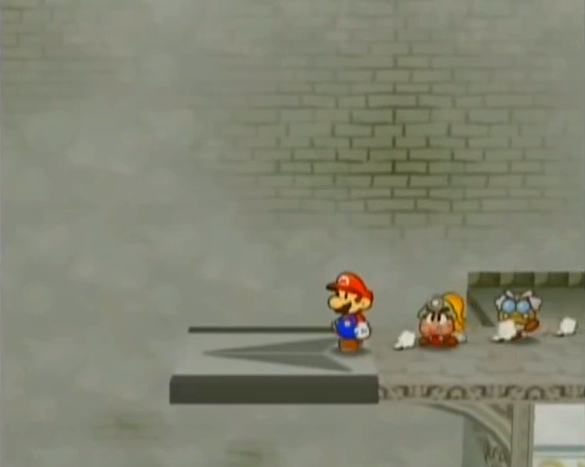 The Tanooki (flying raccoon) suit also allows Mario to turn into an impenetrable statue dressed like a Buddhist monk.You can see a Koopa praying to him in the corner. 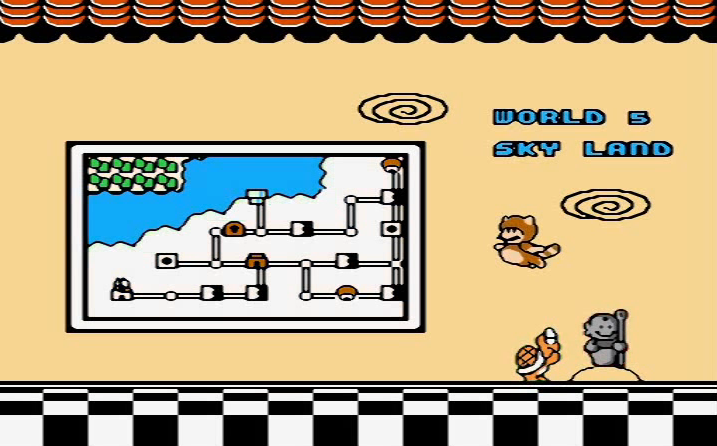 This screenshot comes all the way from Super Mario Bros. 3 (circa 1990). We find one of the greatest links in something that goes unstated. “For as many as are of the works of the law are under the curse: for it is written, Cursed is every one that continueth not in all things which are written in the book of the law to do them. But that no man is justified by the law in the sight of God, it is evident: for, The just shall live by faith. All of the problems we’ve described in the Black Chest Demon sequences-from seeking, to worshiping, to sympathizing with the demons-comes under the Old Testament Law [“ as many as are of the works of the law are under the curse“]. 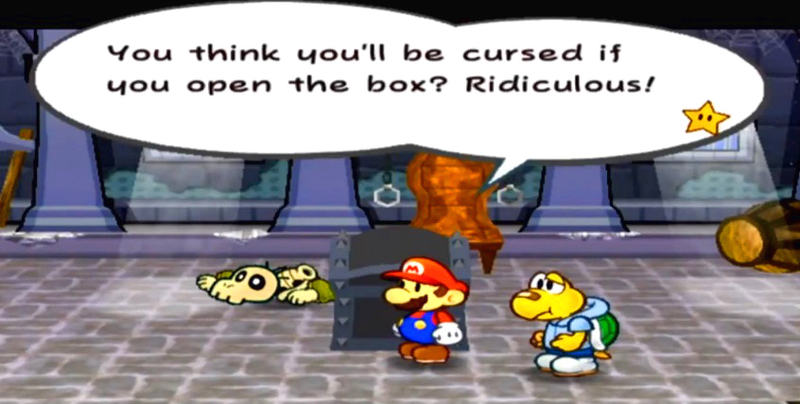 Mario willingly takes on the curses of the demons [“Christ hath redeemed us from the curse of the law, being made a curse for us“] to save the world from the fusion of the Devil and God-the Shadow Queen (analyzed in Thousand-Year Curse Part 1)-that confronts the player at the end of the game. 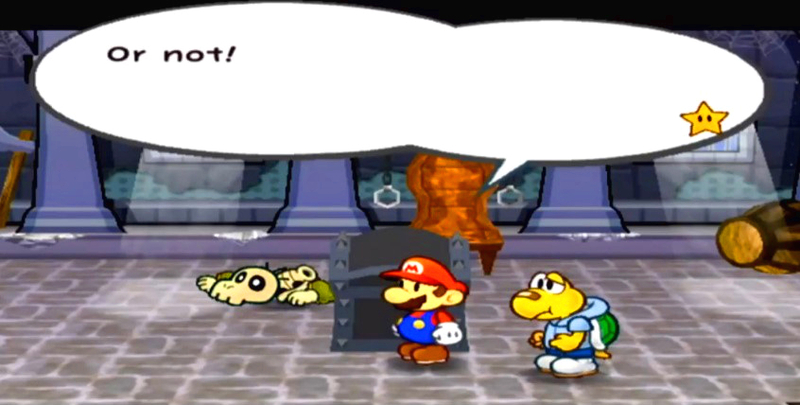 So, symbolically, Mario becomes another savior-another Christ-coming to save us from God himself. This entry was posted in Uncategorized and tagged another gospel, another Jesus, another spirit, anti-biblical, bad, Bible, Black Chest Demons, blessing, christian, christianity, Crystal Star, curses, cursing, demonic, demons, Devil, devil worship, does the Bible talk about Mario?, Does the bible talk about Paper Mario?, evil, fallen angels, false christ, false god, false gods, fire, Four Heroes, gaming, God, good and evil, Goombella, idols, is mario evil?, is Paper Mario evil, Jesus, Jesus Christ, judgment, King of Kings, KJV, kjv bible, Koops, lie, Lucifer, Luigi, Madame Flurrie, Mario, Ms. Mowz, Paper Mario, Paper Mario: The Thousand-Year Door, reborn, retro, review, rise, salvation, Satan, satanic, serving, Shadow Queen, spirit, Super Mario Bros., Super Paper Mario, Thousand-Year Door, transgender, TTYD, video game, video games, video games and the Bible, videogames, Vivian, witches, Worship, worshipping a false god. Bookmark the permalink.